Before we dive into the cure, let’s first look more into what Uterine Fibroids are. 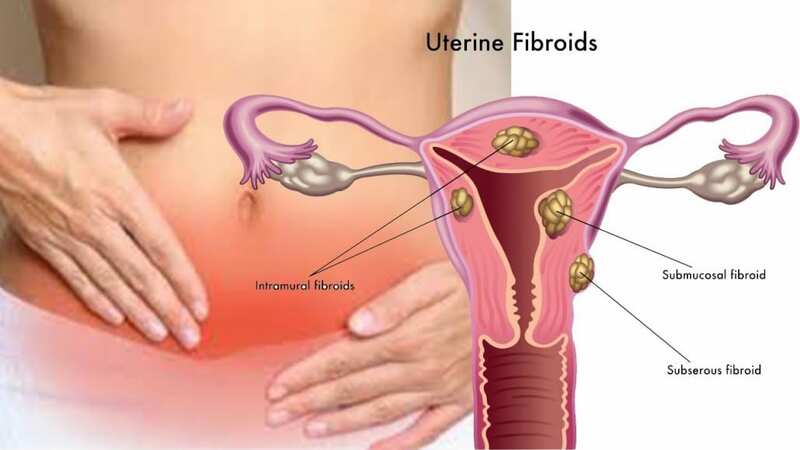 Uterine Fibroids are noncancerous growths on the uterus that usually appear during the childbearing years of a woman. They are also called leiomyomas or myomas. Most of the time, they are just benign growths and don’t develop into cancerous tumors. 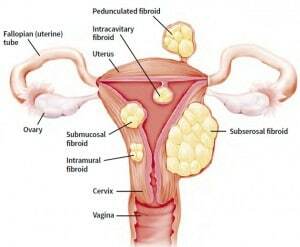 A uterine fibroid grows and develop in the smooth muscle tissue of the uterus. They develop when the cell of the uterus divides itself repeatedly until it develops into a rubbery mass. Their sizes range from too small to be detected by the human eye, to big enough to protrude into the rib cage. Having a Uterine Fibroid is so common that 3 out of 4 women have it, and some are not even aware that they have it. They are noncancerous but they could disrupt the blood vessels and glands which could cause bleeding. Estrogen is one of the hormones in the body that causes the build-up of uterine lining every month. It has also been found that uterine fibroids contain abnormally high amounts of estrogen which lead doctors to believe that estrogen is the one the causes uterine fibroids. This explains why fibroids only appear during the child bearing years of a woman, especially during the time that the body produces high amounts of estrogen like during pregnancy. 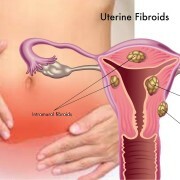 Most Uterine Fibroids shrink and disappear when a woman reaches menopause, or when her body no longer produces estrogen. Another cause of fibroids are the xenoestrogen, these are foreign and harmful chemicals that could mimic the estrogen in the body, causing harmful effects and an abnormal increase in the estrogen level. We could get xenoestrogen from eating foods that have been exposed to pesticide, insecticide and by using products that have harmful chemicals in them. They block the effects of estrogen in the body, and when that happens, the brain signals the body to produce more estrogen causing an increase in the circulating estrogen in our system. They also cause an abnormality in the estrogen breakdown which in turn causes tumors and growths in estrogen stimulated organs such the breasts and uterus. Phytoestrogen are estrogen that are made from plants, so you might be wondering, isn’t that fighting fire with fire? Well, in a way, it is. The fibroids in the uterus treat estrogen as food, they need it in order to grow big and strong. They have high amounts of estrogen receptors compared to any parts of the body. 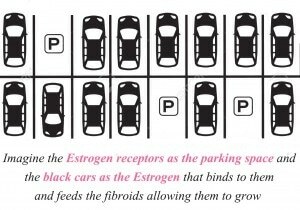 Imagine the estrogen receptors as parking spaces and estrogen as cars, the more parking spaces there are, the more cars it can accommodate. It’s the same thing with estrogen and estrogen receptors, the more receptors there are the more estrogen it could get. 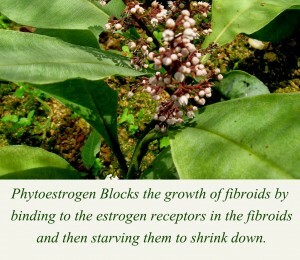 When you take phytoestrogen, it will naturally pair with the estrogen receptors in the body. So instead of the harmful xenoestrogen or the abnormal estrogen, the body will utilize the phytoestrogen instead. 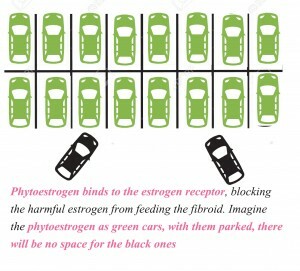 Phytoestrogen “parks” on the estrogen receptors first, beating all the harmful estrogen in the body. When this happens, the body could now regulate the levels of estrogen that it utilizes and produces. What’s the best source of Phytoestrogen? When it comes to choosing which source of phytoestrogen are you going to buy, you should keep in mind that not all sources are the same. Some like soy, does not have enough Phytoestrogen to supply the body in order to help shrink the fibroids. 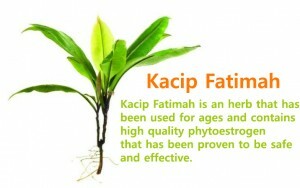 While some, like Kacip Fatimah has high quality phytoestrogen to help shrink the abnormal growths in your estrogen stimulated organs. Kacip Fatimah an herb that has been found to contain high quality phytoestrogen to help you shrink the fibroids. It is organic and is safe to take, it could also be bought in capsules, which makes it convenient. Just be sure that in buying supplements with Kacip Fatimah, you should choose the ones that are made in the US and are doctor approved so you can sure that it’s safe and healthy to take. Fibroids in the uterus may not be cancerous, but they can cause you discomfort and cause you to bleed. The good thing is that you can take herbs that are rich in Phytoestrogen to shrink those pesky growths in a safe and natural way. July 1, 2016 /by Dr. Elizabeth M.
https://vagifirm.com/uploads_cm/2016/07/uterine-fibroid.jpg 720 1280 Dr. Elizabeth M. https://vagifirm.com/uploads_cm/2017/04/vagi_tm_logo.jpg Dr. Elizabeth M.2016-07-01 15:57:062016-07-01 15:57:06Can Phytoestrogen Naturally Cure Uterine Fibroids?